The Tourism Enhancement Fund, the philanthropic arm of the St Lucia Hotel & Tourism Association donated close to $30,000 this week for programs directed at youth development. The Tourism Enhancement Fund made a donation of $26,050 to the Cultural Development Foundation in support of their music education program. Over the years, the Cultural Development Foundation (CDF) has engaged a number of Steel Pan orchestras in training programs in Music Theory and Musical Arrangement. This donation with teach 40 young people Music Theory I and II and help train 25 aspiring pan tuners the art of Pan Building and Tuning. The Fund also made a donation to Cocktails and Contacts, an event birthed by Shernell Lionel in 2014 that provides young professionals the apt environment to network with each other in an effort to seek out opportunities to grow their businesses. A donation of $5,000 was made to a planned seminar to be hosted by Cocktails & Contacts titled; “Five Things Every Entrepreneur Should Know.” Some key topics will include; how to make tax less taxing, technological innovation, positioning your business for great investment, networking the key success and maintaining competitive advantage. The seminar, commencing in early 2016, will seek to highlight key areas which are essential to the success of every entrepreneur and to facilitate an environment within which various options are available to entrepreneurs to aid them fill any gaps identified. The Tourism Enhancement Fund (TEF) is a private sector initiative established in 2013, it is designed to allow the Tourism industry a greater opportunity to play an integral role in the sustainable development of our destination and people. The TEF is financed by a small, voluntary donation from member hotel guests’ of $2 USD per night, and goes towards community development and environmental projects and actions. Both of these programs reflect some of the core tenets of the Tourism Enhancement Fund as it continues to support Human Resource Development at all levels of society. 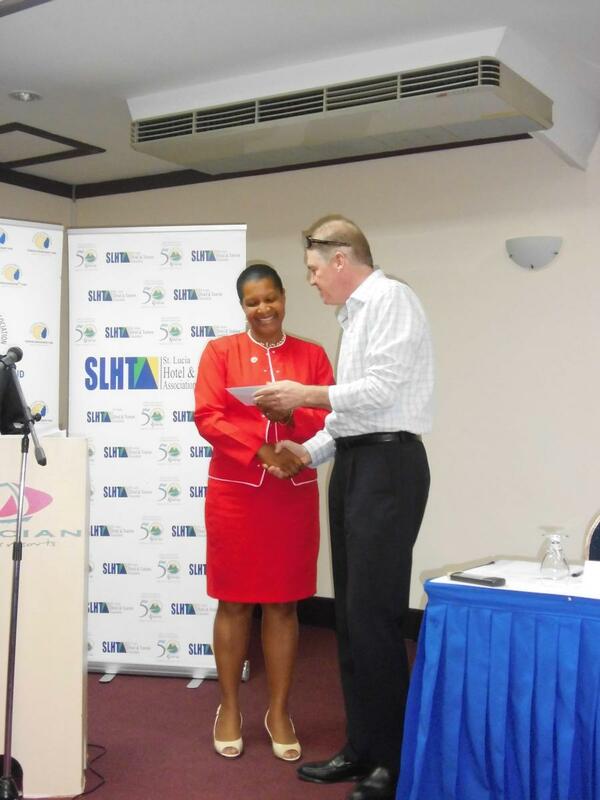 With over $420,000 committed by the Tourism Enhancement Fund to Human Resource Development (HRD), the SLHTA is making significant strides in tackling the unemployment crisis here in St Lucia. It is now commonly accepted that HRD and economic development are inextricably tied together. Research has shown that countries that encourage the growth of critical and multi-skilled individuals in their labor force see an increase in economic prosperity. It is with this in mind that the SLHTA hosted a Human Resource forum for HR professionals in the tourism industry on Friday 11th December, 2015. The forum is a yearly exercise held in order to reacquaint HR staff with local labor laws , to encourage dialogue with other HR professionals and to bring forward questions and concerns that would help the Association better serve them. Of particular interest this year is the introduction of 350 scholarships for e-based learning through GAMA Learning Institute. Recent surveys have shown a great disparity between the qualification requirements for available job openings and the current qualifications of job seekers here in St Lucia. A 2012 Labor Market Needs Survey showed that 44% of job openings required tertiary education but only 7% of Job Seekers had tertiary education training. Even more alarming 60% of Job Seekers were said to have qualifications below secondary education. Researchers have observed that there has been a change in the demand and supply pattern of human resources for the travel industry, with the demand in favor of more educated and specialized personnel. These scholarships will effectively address the needs of ambitious, intelligent industry workers who are will be well primed to become multi-skilled employees who will grow with their organization and meet the demands of a changing tourism industry. This initiative is indeed well timed as the tourism industry was predicted to encounter commendable growth in 2015. In 2014 Travel & Tourism directly supported 15,500 jobs (20.4% of total employment). This was expected to rise by 5.7% in 2015 and rise by 2.9% pa to 22,000 jobs (24.7% of total employment) in 2025. In his opening statement to the December 11th HR Forum, SLHTA Chief Executive Officer, Noorani Azeez noted that “Human Resource Development is globally coming into focus as being critical to productivity, competitiveness and in creating positive and empowering work cultures”. In 2015, the Association committed over $420,000 in Human Resource Development programs including its successful Tourism Internship Program. These e-learning scholarships will offer students over a 100 choices of courses directed at skills necessary for the hospitality sector and present employees with an opportunity for promotion and for reassignment into a new and exciting career path. The $29,000 worth of GAMA course scholarships will go to employees of member organizations who have contributed to the Tourism Enhancement fund. Additionally, non-contributing member companies of the SLHTA will receive 100 of the 350 scholarships. The Association is therefore committed to helping this area climb the priority agenda here in St Lucia and hopes to see a continued refocusing of energies towards Human Resource Development. Splash Island Water Park St. Lucia, the Caribbean’s most exciting water-based attraction recently announced the opening of registration for St. Lucia’s very first Ninja Warrior Challenge. Patterned after the popular game show, American Ninja Warrior, the St. Lucian version will feature a series of fun competitions including water volleyball, relays and time trials and will be held at Splash Island Water Park on Reduit Beach on Saturday November 14 from 10 am. Many locals and visitors are expected to flock to Reduit Beach on November 14 to catch some of the excitement but those who don’t catch it live will now be able to view it on MBC Television (Flow 52 and 120, LIME 27 and 42) who will be covering the contest from multiple camera angles, including from the sky using overhead drones! MBC Television, the official television station of the popular Blackheart Football tournament has a lot of experience covering and producing high quality sports programming and is excited to be part of this fun and innovative competition. The announcement of the contest has generated a lot of excitement and interest with several available spots already being taken up by teams from Bay Gardens Resorts, Sandals Resorts, Rex Resorts, St. James Club Morgan Bay Resort and Sharks Swim Club among others. Registration is just $60 EC ($50 EC for St. Lucia Hotel and Tourism members) per person for teams of 4 or more. The park’s Managing Director and founder, Mrs. Julianna Ward-Destang expressed her gratitude to the competition’s sponsors which include Monster Energy Drink, Blue Waters, Real FM and MBC Television and to the St. Lucian public for their support of the water park. “So far more than 60% of our park patrons have been St. Lucian Residents and we are thankful for the support and are happy that the park has been able to have such a positive impact”. As one can imagine, the teams who have signed up so far are also very excited. Perhaps none are more excited than the team from Splash Island Water Park/Bay Gardens Resorts who recently posted an open video challenge on the park’s Facebook page which has already garnered close to 4000 views. “Our Ninja Warriors from Bay Gardens Resorts are ready to take on all comers and are eager for a fun filled day of competition,” stated Ward-Destang. To find out more and to register visit www.stluciawaterpark.com/contests or call 457-8532. Located on the the Northwest coast of St. Lucia, on the popular Reduit Beach, Splash Island is the Caribbean’s first open-water sports park. Opened in August 2015, Splash Island is located in front of the multi-award-winning Bay Gardens Beach Resort & Spa located in Rodney Bay Village, Gros Islet, St. Lucia. The park consists of over a dozen features including the Iceberg XXL, monkey bars, trampoline, a double rocker see-saw and the Action Tower and is designed to promote social interaction, balance, coordination and motor skills development and refinement in a safe, fun and supervised environment with certified lifeguards on duty. Support for our colleagues goes beyond the St Lucia boundaries and that is evident in our support for Dominica!Thanks to the Tourism Enhancement Fund & Our Kind Visitors/Guests who contribute to the Fund. 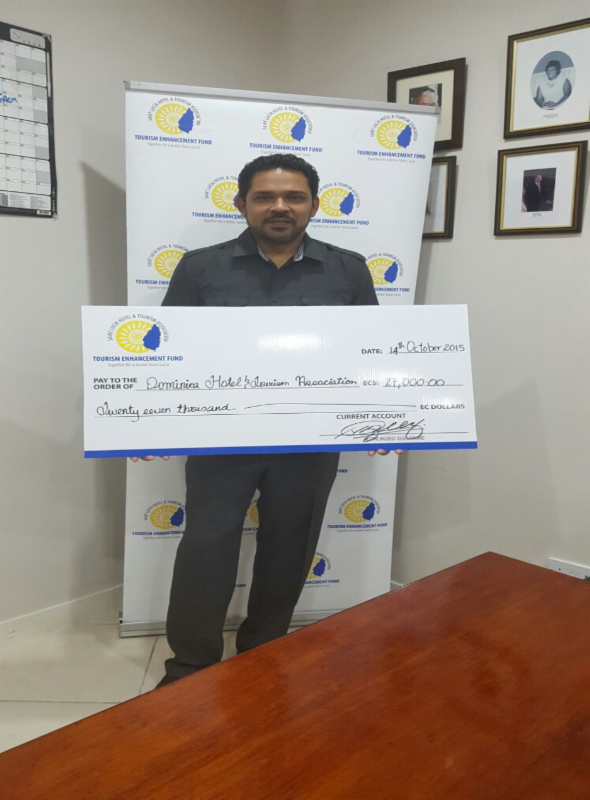 On Wednesday 14th October 2015, the SLHTA presented a cheque for $27,000 to Mr. Ross Stevenson a representative of the Caribbean Hotel And Tourism Association (CHTA) to be transferred to the Dominica Hotel and Tourism Association (DHTA) for disaster relief efforts in Dominica. Last month Karolin Troubetzkoy, President Elect of the Caribbean Hotel and Tourism Association, rallied support from a number of hotels across the region to pledge room nights which are being auctioned to raise revenue which will do directly towards a disaster relief fund managed by the CHTA and the Dominica Hotel and Tourism Association to aid victims of the storm ravaged island. The $27,000 cash donation comes from the Saint Lucia Tourism Enhancement Fund and will be added to the revenue raised from the room auctions. “Unofficial reports are that at least four persons are dead and several others are missing. The Gros-Islet City Council handed out awards to four groups that submitted projects for the Best Community Project/ Pli Belle KominKonpetisyon competition on Thursday, September 17. Mayor of Gros-Islet Alison King who delivered the feature address congratulated the winners of the competition and encouraged them to continue to promote safe and clean environment in their respective communities. King said that the competition was launched in commemoration of Earth Day 2015 and was aimed at getting communities involved in making their living spaces cleaner and more resilient to natural hazards. Community groups from across the entire constituency of Gros -Islet were targeted. 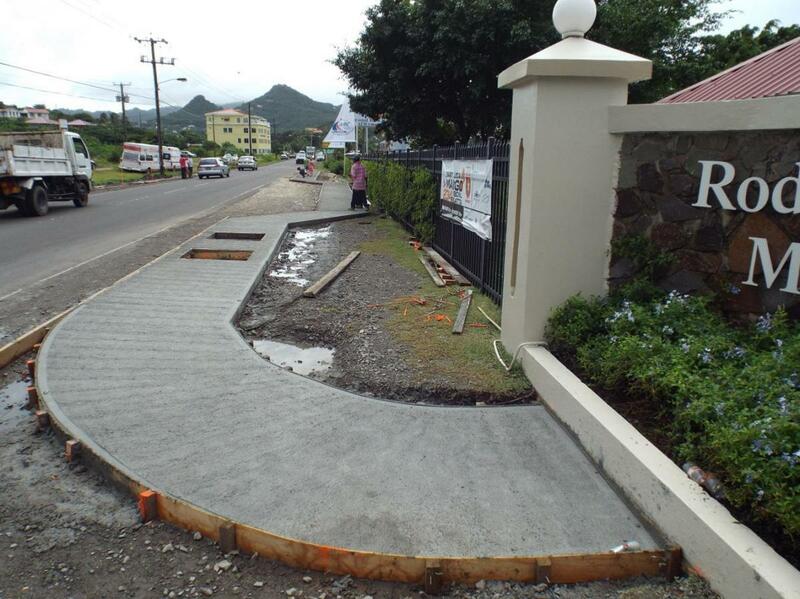 “While the council shares responsibility with central government for maintaining public spaces within our communities, we sought through this initiative, to encourage communities to take a greater interest in and responsibility for community spaces, and to improve their aesthetics, utility, safety and/or performance, in support of the council’s own work,” King said. But more than that, King said the competition has the potential to provide the council with a keener insight into community priorities as perceived by communities themselves, and to identify and support community-driven projects that may be eligible for third party funding. The competition looked at several initiatives which include: clean up and upgrade schools, community spaces and facilities; cultivate flowers or other crops on a communal basis; stabilize slopes and improve community drainage; improve waste management; improve community safety; and to improve historical buildings and other sites of cultural or historical interest, whether publicly or privately owned. Proposed categories for prizes were: most improved space (greening), most improved building, most improved school, most sustainable project, greatest improvement in public health and safety, greatest community participation and greatest youth participation, among several others. The competition ran for 4 months. 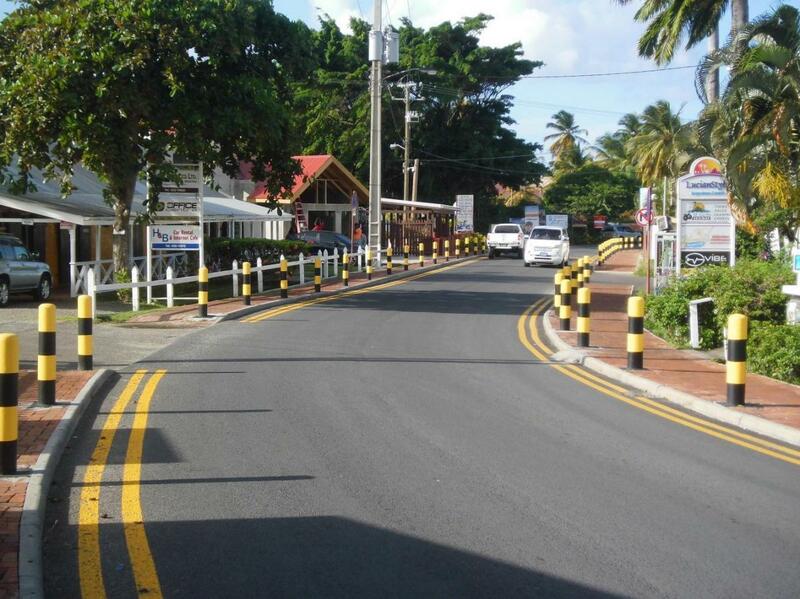 Despite making the competition criteria as wide, the Gros-Islet City Council only received 4 submissions. King admitted to some level of disappointment with the amount of interest shown, particularly from communities beyond the town of Gros-Islet. 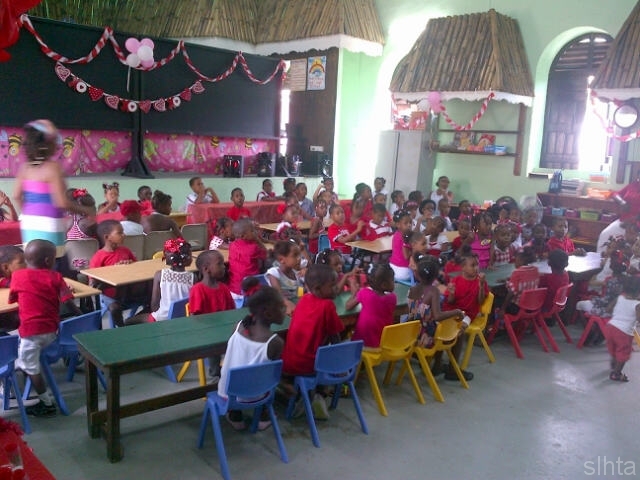 However, she said this could be attributed to low levels of participation in CBO and NGO movements within the constituency of Gros Islet, difficulty accessing land to implement some of the ideas developed by communities, limited resources and the timing of the competition at the end of the school year, and into the school holiday period. “Hopefully, the successes of today will stimulate more community interest and participation in future competitions. Although the number of submissions we got was low, we have to follow this observation quickly by noting that the quality of projects submitted, was without exception, very high, and demonstrate what it is possible to achieve when communities come together to achieve a common goal,” King added. 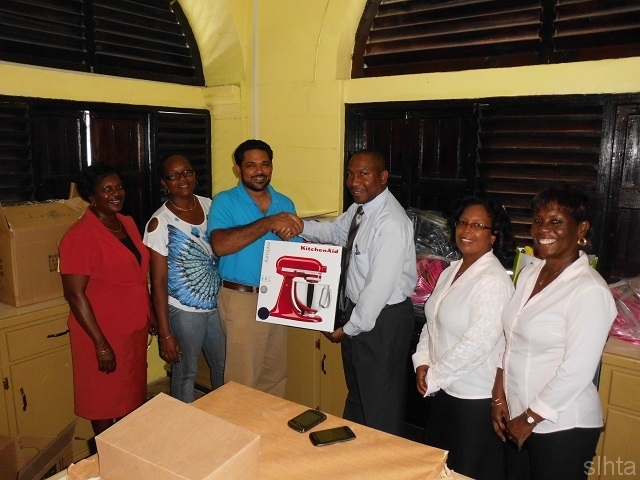 The competition received financial and material support from: the St. Lucia Hotel and Tourism Association, LUCELEC, Taj Weekes, Dannion CE, the Department of Forestry, Rayneau Construction and Industrial Products, Ace Hardware, Carasco and Son, and Amarna Consult Ltd. The council said it hopes the competition will become a regular feature of the town’s calendar of events. On October 20th 2015 the SLHTA in collaboration with the Embassy of Mexico and the Embassy of Spain introduced a Pilot Programme to hospitality Industry Workers. This Programme will be ongoing and is targeted at delivering an 8 week Spanish Language Training Course to Supervisors in the food and beverage department, front office, reservations, housekeeping and the spa department. The SLHTA continues to encourage training and development of industry workers and wishes all employees who have signed up for this programme success in the Spanish Language Course. The Saint Lucia Hotel and Tourism Association congratulates Nicola Esnard and Kurtney Gill of the Soufriere Comprehensive Secondary School who represented St Lucia at the Caribbean Junior Dueling Competition. This year, the event saw a total of 9 Caribbean islands participating including Trinidad & Tobago, St Vincent & the Grenadines, Grenada, Anguilla, Barbados, Bonaire, St Croix, St Lucia and Dominica. After 3 rounds of tough competition, including Signature Dish, Mystery Basket and Finals team St Lucia performed exceptional. The team was able to secure a silver medal in the Signature and Mystery Basket Dish and a 3rd place in the Finals. Preceding the actual competition, the participating teams benefited from presentations by experts in the industry as well as illustrations and other presentations by sponsors. 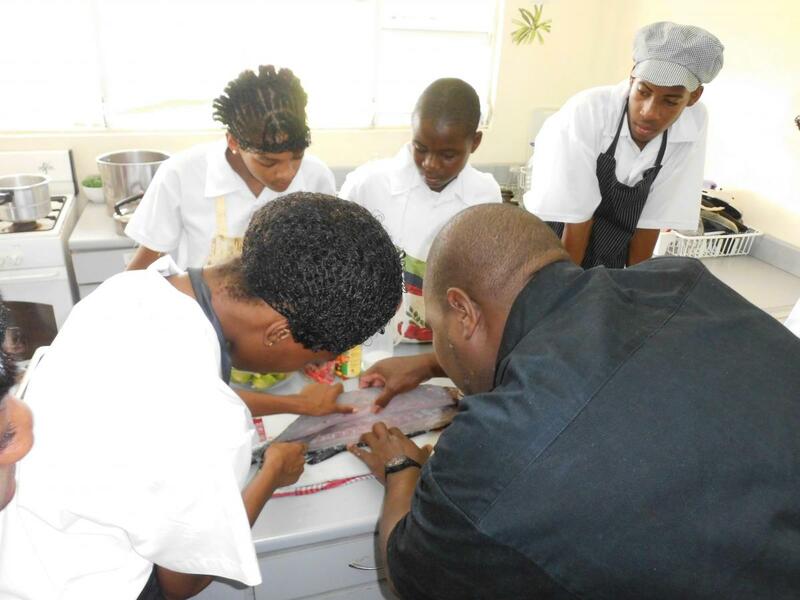 The SLHTA is very proud of the success of this year’s Junior Culinary Team. 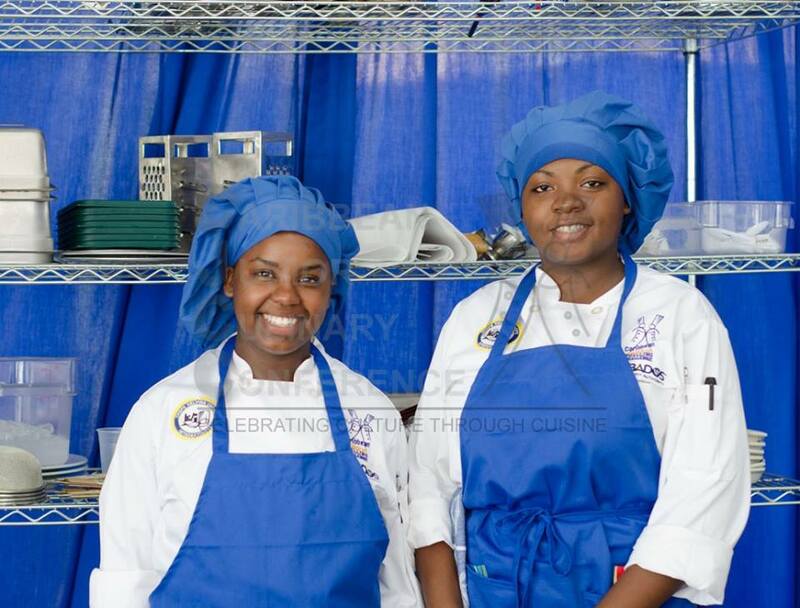 The team who represented Saint Lucia was students from the Soufriere Comprehensive Secondary School won the recently held SLHTA Chefs in Schools Cook-Off Competition. The Tourism Enhancement Fund was the main sponsors of the Chefs in Schools Competition, and also funded the team’s trip to Barbados. The Visitor Channel has recently completed the production of five (5) mini documentaries for a ‘Pilot Program’ promoting small properties in Saint Lucia. 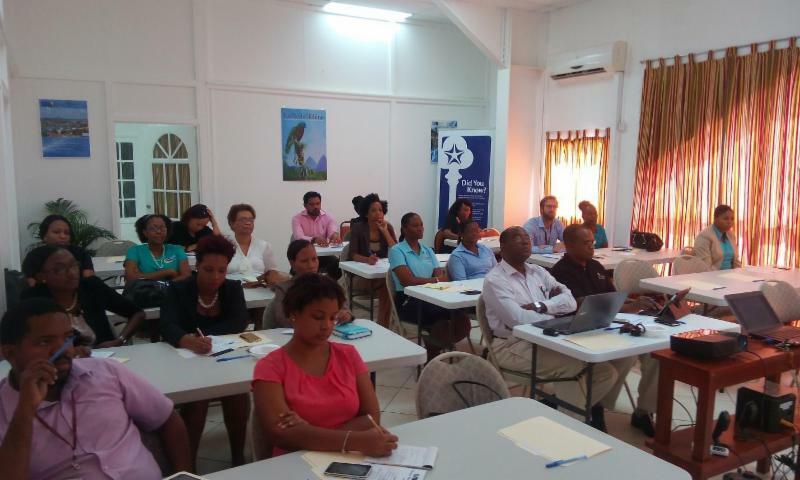 This pilot project was sponsored by the SLHTA’s Tourism Enhancement Fund which was established in October of 2013. These short contemporary stories of 5 individual owners, demonstrate clearly how people are the makers of an unforgettable holiday experience. Leading up to the main holiday season, the Visitor Channel expects the increased visibility of these properties, to result in additional business for the owners and their staff. With the short stories airing soon, viewers will be treated to the unique nature of these types of properties. Small properties world wide have already been recognized as attractions for more independent travelers, who are more adventurous and contribute more directly to local communities. Until the end of November 2015, the Visitor Channel is offering a special rate for productions and advertising, to the owners of the small properties and guesthouses in Saint Lucia. More information is available at: visitorchannel@gmail.com – Subject HGems Special. Managing Director of the Visitor Channel Mr. Andre Alexander and his team are pleased to share that the pilot production, which took place with five guesthouses, in various parts of the island, have contributed immensely in proving that Saint Lucia is by far more than simply beautiful. 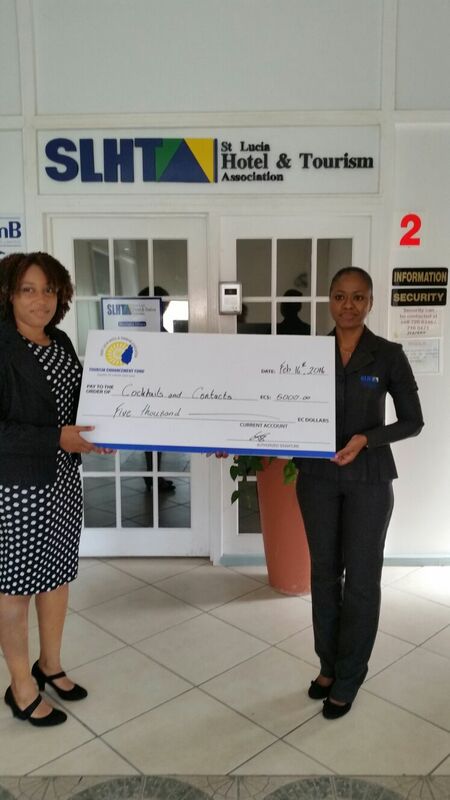 The Saint Lucia Hotel and Tourism Association Inc (SLHTA) hosted an official check handing-over ceremony for Jus’ Sail at its office in Rodney Heights, Gros Islet on Friday June 5th 2015 at 10:00am. 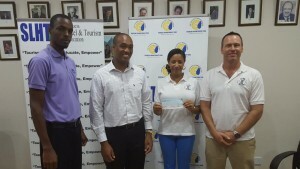 The SLHTA’s Tourism Enhancement Fund (TEF) contributed approximately EC $30,000.00 towards Jus Sail’s Youth Training Programme which will see 10 additional young unemployed Saint Lucians gaining valuable life skills and experience. 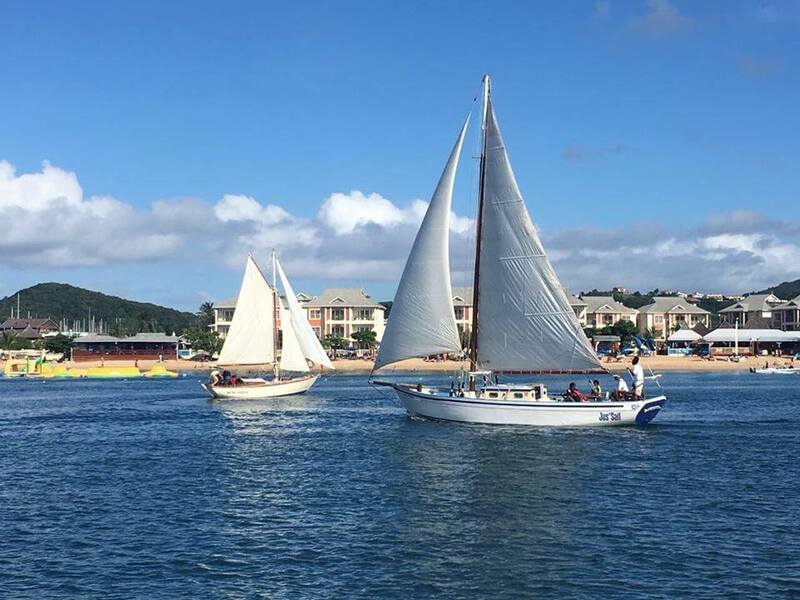 Jus’ Sail’s focus is geared towards reviving St Lucia’s maritime culture through the engagement of youth in learning to sail and helping them gain employment within the industry. Jus’ Sail run youth training programs during the off-season summer months. The training programme has three tenets which underlie its focus – Training – Certification – Employment. To learn more about Jus Sail Youth Training Programme visit their website at www.jussail.com/youth-training-programme/. The SLHTA sees this programme as an opportunity for many of our unemployed youth on the island to be exposed to a sector that has been underutilized and almost untapped. The Jus’ Sail Youth Training Programme is funded through donations from their guests and corporate sector. The Association fully endorses this programme and wishes Jus’ Sail all the best throughout the training programme. The Tourism Enhancement Fund has been created to allow the SLHTA to play an integral part in the sustainable development of our destination. 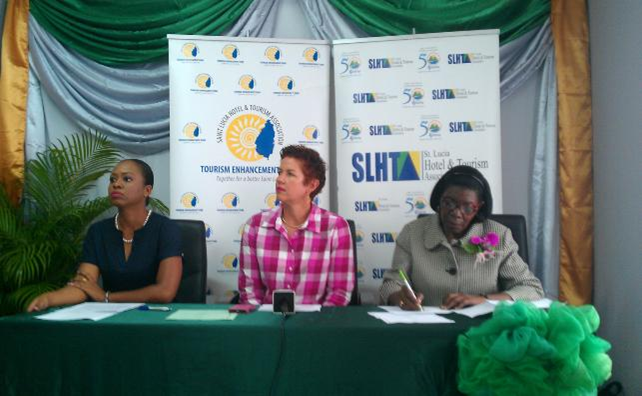 Through the Tourism Enhancement Fund, the SLHTA will be able to direct development efforts where they are most needed. Resort guests and all other island visitors are asked to proudly be part of this exciting initiative and donate US$2 for each night of their stay at Resorts here in Saint Lucia which will go entirely towards our Tourism Enhancement Fund. 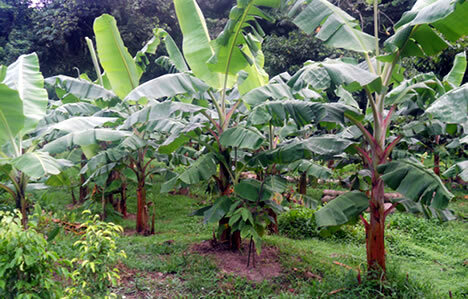 On 22nd April 2015, the Gros Islet Constituency Council launched its Pli Belle Komin Konpetisyon (The Beautiful Community Competition) in commemoration of Earth Day 2015. 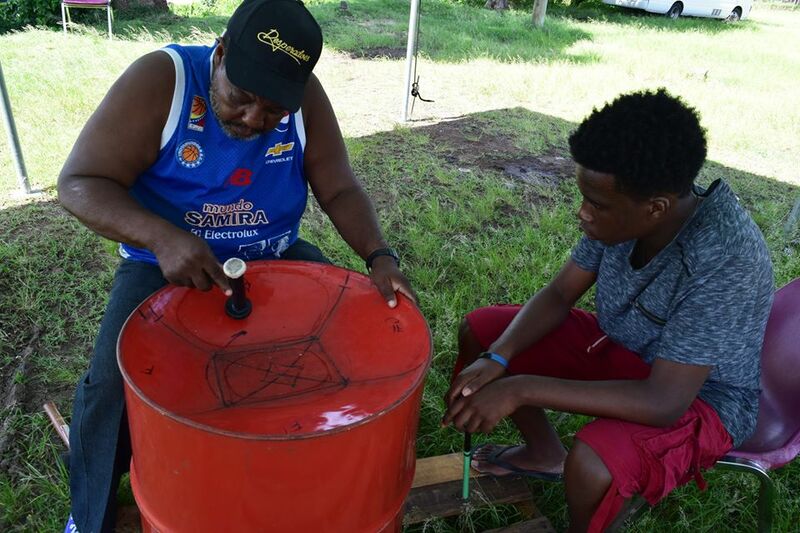 The competition seeks to encourage communities across Gros Islet to take a greater interest in and responsibility for community spaces, and to improve their aesthetics, utility, productivity and safety. Other positive outcomes will be an identification of community priorities and development of a bank of project concepts for community-driven projects that the Council may be able to support for possible future grant funding. 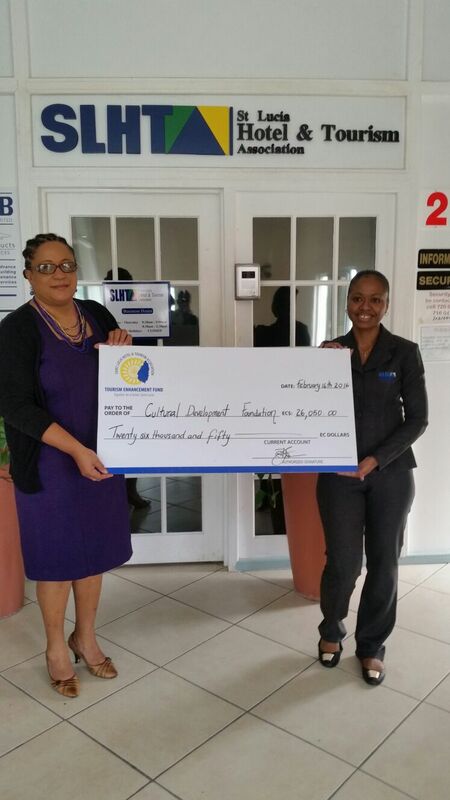 The Pli Belle Komin Konpetisyon is being supported by the St. Lucia Hotel and Tourism Association Inc. , which has generously donated EC$20,000 in prize monies to this initiative. Additional cash or kind prizes are also being sought from the private sector. So far, Ace Hardware and Carasco and Sons have committed to in kind contributions. Improve area lighting, preferably using renewable technologies. Interested groups should call the Gros Islet Constituency Council at 450 0731 or email queries to grosisletcouncil@gosl.gov.lc Application forms can be obtained from the Council in hard copy or by email, or can be downloaded from the competition Facebook page: https://www.facebook.com/PliBelleKominKonpetisyon Participating communities are encouraged to post project updates to the Facebook page. Additional information on prize donors and categories can also be found on the Facebook page.